Welcome to ION Guard, the first issue of ION Space, a series of licensed supplements for ICONS - Superhero Roleplaying by Adamant Entertainment! The Intergalactic Ordinance Network (ION) Guard is a heroic peacekeeping organization that has served to protect and defend the intelligent species of the many sectors of the Universe for the last billion years. Each Guardsman - wearing the iconic golden ION Fist that has become synonymous with justice for many intergalactic inhabitants - is a cosmic powerhouse, capable of bringing the vast forces of an artificially harnessed singularity to bear against the enemies of peace, justice, and life. Throughout the Universe they strive against evil and darkness. Though powerful, they are spread all too thin: they are but small lights, beacons of hope in the vast darkness enfolding the stars. ION Space will introduce alien species and empires, interplanetary organizations, and galactic empires, and cosmic threats. Each ION Space issue may be slotted into your existing ICONS campaign individually, or woven together to provide a vast and expanding outer space setting for your heroes to explore...and defend! When is Ion Guard - Alien Empires coming out? I've been waiting on it for awhile and its advertised at Atomic Ape's home page. I really need some more ICONS stuff, so very little of it recently. I read somewhere Adamant was going to license it and print something... with the unpublished material for Alien Empires in it. Are you just gutting it and giving it over to Adamant and now we have to wait on them? I could really use some more ICONS... this stuff is just addictive. 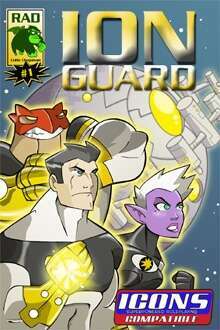 Oh, by the way, Ion Guard is a great piece of work. I am usually not one to follow the Green Lantern stuff... always thought they were a bit hokey. You took these general ideas and just worked some kind of magic. Oh... and a 'Golden Fist'... just... just poetic. Keep up the good work... and give us some more ICONS, if its even on your radar anymore. Thanks in advance for your time and response. It's been almost a year since I asked the question above. I'm not sure this company is active anymore. All of their products here are for free. Their homepage blog hasn't had activity since 2010 when they announced the release of this book's sequel Alien Empires. Their forum announced as of 2012 that the main writer was vacationing in France and about to move to New Zealand. Probably got caught up in a life herding sheep and forgot about the modern world or something. New Zealand claims another victim. For reference, Colin Chapman, the owner of Radioactive Ape, had some sort of pretty severe financial/medical/family problem and has pretty much dropped out of the gaming industry. This title was added to our catalog on August 01, 2010.